Cranberries are my new big love. Their bright red color cheers up any dull winter day, and their tartness is wonderfully refreshing. They’re a great companion for brown sugar, apples or oranges. Up until a few months ago I only used dried ones in muffins and scones, but I’m completely converted now and have a bag of fresh cranberries in my fridge all the time. So far my best recipe for them is a tart that I came up with for last year’s Thanksgiving dinner. After making a roasted cranberry and orange sauce for the turkey, I kept looking for a way to use the rest of them. My first reference book for baking is Once Upon a Tart by Frank Mentesana and Jerome Audureau. I fell for it the very first time I put my hands on it and since then have never parted with it. Two of my friends got it because of my constant nagging. If you like baking tarts – sweet or savory – this is the book to start with. I found a recipe for an apple and cranberry tart, which I used as a base for my recipe. The result was an amazing sweet-tart pie that looked great and tasted even better, and which has become a huge successes with friends and family. The number of fans grows each time I make it. Next step will be to turn the filling into a jam to keep the energizing taste of this winter classics – cranberries, apples and dates – for longer. Tart crust makes every home baker a little nervous, but it shouldn’t. Once you get your gear and temperature right, it’s not scary at all. The most important thing is to have very cold butter and a rather cold kitchen when making the dough. This is why you shouldn’t turn the oven on before you finish making it. You can make the pastry a few hours in advance and keep it in the refrigerator. I roll mine out and put it in the tart pan, and keep it in the freezer if I’m going to bake it within a half an hour or so. I make the crust by hand, as my kitchen has been absolutely glacial over the past few weeks and I have a pastry chef’s cool hands. Mix all the dry ingredients in a bowl, add the butter cubes and using a pastry blender (if you’re lucky like me to have one) or two small knives held parallel to cut the butter into the flour. Work fast until crumbs form and the butter is roughly worked into the flour. You can use a food processor with a metal blade to mix the dry ingredients and butter into crumbs – pulse, don’t run the processor – you don’t want the flour and butter to mix completely. Dump the crumbs into a bowl, sprinkle 4 tbsp icy water over them, and start bringing the dough together. Add more water, one tablespoon at time if it’s hard to get it together, but don’t panic and don’t add too much – the dough shouldn’t be sticky, it should still be quite crumbly. I never give it more than six tablespoons of water, and usually four or five are enough. Cut the dough in half and flatten it into two discs on wax or parchment paper. If too warm to be rolled, put them into the freezer for 5-10 minutes. Take out, place plastic foil or another piece of parchment paper on one of the discs and roll it about ¼ inch (6 mm) thick. Wrap it around a rolling pin dusted with flour and transfer to the tart pan. Fit it in, cut the excess dough, patch the places where it needs more (usually the edges) and place the tart pan back in the fridge. Proceed with the second disk – you’ll need it to cut strips to decorate the top of the tart. Put it into the fridge until you make the filling. Preheat oven to 400°F (200°C) with racks positioned in the middle. In a saucepan mix the apples, cranberries and dates with the spices and sugars over medium heat and cook until the cranberries pop-up – stirring occasionally, about 10 min. Don’t let it boil. Cool the filling to room temperature and spoon it into the prepared tart shell. Cut strips from the second disc about ½ inch (1 ½ cm) wide. Lay them in parallel over the tart, with another set of strips in the opposite direction. 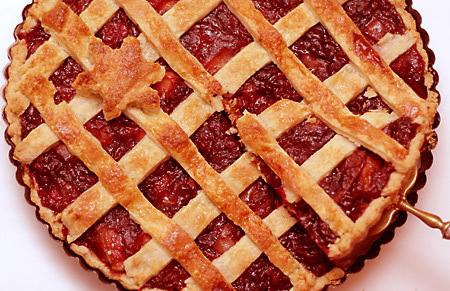 This is elegantly called lattice crust and is used to make even plain desserts look better. Brush the strips with the egg wash using a brush or even a paper towel, and sprinkle them with sugar. Bake for 40-50 minutes, until the crust is golden brown. Take out, let cool slightly and remove from the pan (best to use one with a removable outside ring) placing it on a big can and sliding the outside part off. Put the tart on the counter and slide off the form bottom, being careful not to break it. Serve with a scoop of vanilla ice cream. The taste and smell of this tart is entirely addictive. I promised myself not to say a word about the frigid, arctic, polar weather outside, as I’ve spent the last two days complaining about it on Facebook. My favorite local radio station (too many weird sounding letters and numbers to remember) is playing a double feature today – Coldplay (ha) and The Cure (ha-ha), two of my most-beloved bands, which also makes a nice little self-mocking comment to all my fellow frozen Chicagoans. So here is my own cure for very cold-weather play – chocolate. Always one for a good, dark, full-bodied bittersweet chocolate, I usually have my pantry stocked with it. I haven’t found a good US-produced brand yet that would be affordable in big quantities, so I go for the European ones – Swiss, Belgian, but also German. Buy the best one you can afford – good quality chocolate makes all the difference and gives the desserts a silky, dense body that makes them irresistible. Hot chocolate is a classic cold weather cure, and I finally have a recipe that is fuss free, uses real chocolate (never a fan of the powdered stuff) and quick. It’s my own take on one from the December issue of Bon Appetit. I doubled the amount of milk, heavy cream and chocolate – the original wasn’t enough for the four of us. As it was a Christmas recipe it also calls for mint candy cane, but you can skip this – especially as they’re not easy to get outside the US. Everybody here except me loves marshmallows, so sometimes I add tiny ones or a splash of alcohol for the adults. 4 candy canes or mini marshmallows – I’ve made it with Hershey’s chocolate-mint candy canes and marshmallows – there’s nothing like boosting your sugar level when it’s hostile outside. Bring the whipping cream, milk and sugar to a boil in a heavy-bottomed saucepan over medium high heat, whisking all the time – I’ve met only one person who likes skin on milk. Remove from heat. Whisk in the chocolate until smooth, add the extract (if using) and divide between mugs. Decorate with the marshmallows and/or candy cane and drink up – it’s the best-tasting cold medicine you’ll ever get. The other chocolate creation this week was a delicious and child proof cake from How to Be a Domestic Goddess – Nigella Lawson’s classic. I have had the book for some time now, but this is the third recipe I’ve made – or in this case I actually only assisted. It was my eight-and-a-half-year-old that chose the recipe and made it from scratch. She was bored out of her mind on sick leave from school, and letting her dive into the world of chocolate cakes was my way to regain control of my laptop. We used sour cherry marmalade instead of orange, but the result was great, as with all of Nigella’s desserts. Preheat oven to 350°F/180°C, rack positioned in the middle. Melt the butter in a medium heavy-bottomed saucepan over low heat. Add the chopped chocolate and when it starts melting take off the heat and stir with a wooden spoon or silicon spatula until completely melted. Add the marmalade, sugar, salt and eggs. Stir until smooth. In a small bowl combine the flour and baking powder and start adding to the chocolate mix bit by bit. When all is incorporated pour the batter into a springform, shake a little to distribute it evenly and bake for 50 minutes or until a skewer comes out clean (always test the middle of the cake). Let it cool for 10 minutes on a rack, before taking out. If you’ve done a good job on buttering and flouring the form taking out the cake shouldn’t be a problem – when ready it shrinks a little bit and goes off the walls. It looks quite plain, but smells amazing and is moist and slightly sour from the marmalade. We played with ours – Maia cut stars and Christmas tree shapes from a cereal box and we used them as stencils. 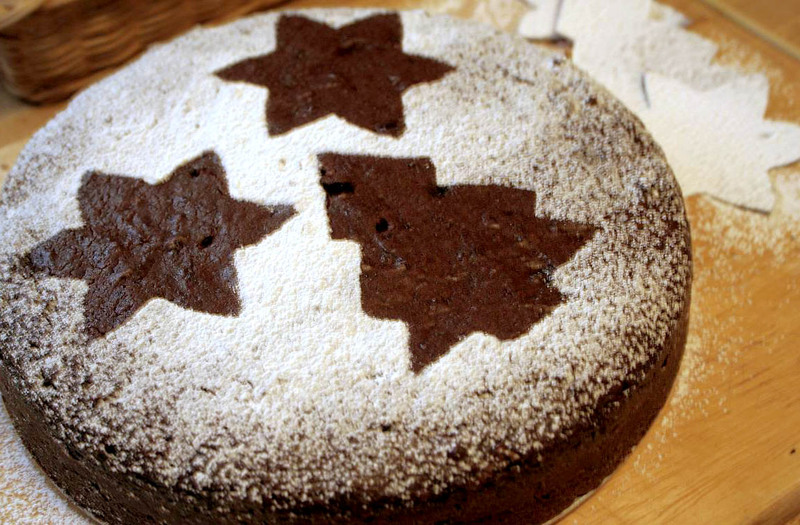 We placed them randomly on top of the cake and dusted it with icing sugar, as Nigella suggests. It looked perfect. Not surprisingly, however, it soon disappeared. The temperature in Chicago is -15ºC and dropping fast. Stuck at home with one sick child and another about to follow suit and no prospects of flying to Florida or the Dominican Republic like some of my friends are, I got out the muffin tin. The weather conditions are perfect for home baking, which I find warming, relaxing and tasty. The basic recipe I use for muffins is adapted from an old pre-prison Martha Stewart Holiday Baking special issue. Not that I haven’t tried others, but this one works great every time and is very easy. The original calls for fresh raspberries. I’ve done it with blueberries, cherries, apples, dark chocolate chips, white chocolate chips, raisins, dried cranberries and frozen berries (don’t defrost them) of all sorts and combinations of the above. Still, the best muffins for me are the my latest variation – dried cranberries and white chocolate chips. They are not too sweet and just the right treat for a frosty day. If you are a butter hater don’t make these – they need the entire dose of real unsalted butter, or they will be flat, dry and boring. As with any simple recipe, this one also needs the best ingredients you can afford, but without going overboard. The measurements are in US cups, but IKEA sells those everywhere. If you are used to g and ml – there are good conversion sites in the net. I find cups great and easy. For a kids’ party, but not only, you can easily double the recipe, and if you have one of those monstrous American ovens you can fit two tins on the same level. If you are brave enough and have the counter and floor space – let the children help. 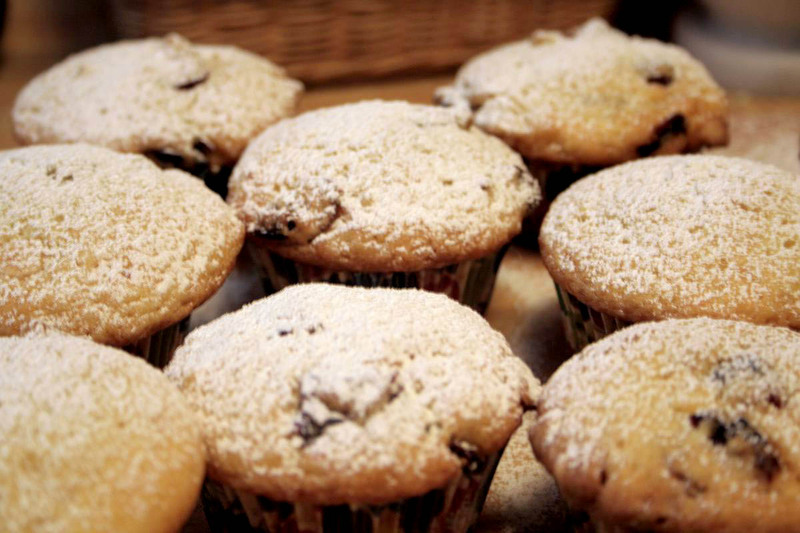 Muffin making is very kid-friendly. I always use child labor when not in a hurry. Preheat the oven to 350ºF (180ºC). Position rack in the middle section. Melt the butter with the vanilla pod and seeds over low heat, or in the microwave. Let it cool and discard the vanilla pod. In a large enough bowl mix the flour, sugar, salt and baking powder. Add the butter, eggs and buttermilk and stir with a wooden spoon or silicon spatula until the ingredients have combined. Don’t overwork the batter – it needs to be airy so the final result will be a light and moist little cake. Add the cranberries and chocolate and stir to incorporate. Place baking paper cups into the muffin tin forms – one thing I love about my new location – unlimited supply of those in every color and pattern possible. If you don’t have those – butter the forms well. Using two spoons, fill the muffin cups completely and bake until golden for 25 to 30 minutes. Don’t open the oven door before at least 20 minutes have passed, as you can ruin the “mushroom effect”. Let the muffins cool on a rack or, as in my case, a wooden board. Sprinkle with confectioner’s (powdered) sugar and grab one before the hordes arrive. They are best 20 minutes after baking, with a cup of cold milk, but are very good even the next day – if any are still left.